Comm Eye Health Vol. 20 No. 63 2007 pp 42 - 44. Published online 01 September 2007. Addressing refractive errors, the second major cause of preventable blindness, is now a priority for eye care programmes. Although a simple pair of spectacles will correct refractive error, there exists a high prevalence of uncorrected refractive error. This is due in large part to the cost and inaccessibility of refraction and spectacle dispensing services, which are usually offered only at secondary and tertiary eye care centres. The optometrists and ophthalmologists who provide these services are often kept very busy providing a range of other eye care services as well. This means that the number of refractions they have time for falls short of community needs. The distance to these secondary and tertiary eye care centres also hinders access. In addition, people who have been refracted and who have received a spectacle prescription need to have access to an affordable spectacle dispensing service. Since most spectacle retailers are concentrated in bigger towns, accessibility is a major challenge for communities in rural areas. To solve the problem of uncorrected refractive error in low- and middle-income countries, it is therefore important to provide comprehensive services – both refraction and dispensing of spectacles – at the primary level of eye care, where they will be most accessible to the community. spectacles which are acceptable and affordable to the patient. Integrate refractive error services at all levels of eye care delivery and patient contact, including the primary level, as is done in Indias vision centres (primary eye care centres). Integrate refractive error services into outreach services, thereby bringing primary level eye care closer to communities. Dispensing spectacles in addition to providing refraction may improve the sustainability of a refractive error service and increase uptake by patients. The primary eye care centre or vision centre is a model that combines both these components of refractive error services ata single service point, close to where communities live. spectacle dispensing, which includes offering a range of frames from which patients can choose. An important first step when planning a primary eye care centre is to estimate the potential demand for spectacles. The prevalence of refractive error varies between age groups. Where reliable data are available on the age distribution of the population at country and sub-country levels, the rate of refractive error in different age groups can be estimated (preferably from studies done in that area, or from personal experience) and the total demand can be calculated, as shown in Table 1 (using data for India). In most situations, one can expect about 20 per cent of the population in total to require refraction services. A primary eye care centre serving a population of 50,000 therefore has a big enough potential market to make it economically viable. Given the very low coverage and penetration of existing primary eye care services, a primary eye care centre should not only cater for those who visit it, but it should also proactively seek out those who need correction. Marketing strategies should be specific to each age group, as suggested in Table 2. Preliminary vision tests are conducted by trained field workers or teachers (in the case of schools and colleges) to identify those with vision worse than 6/9 (or 6/12 for school children). These people are then referred to the primary eye care centre for further investigation. When a large number of prescriptions are expected at a school, college or workplace, the complete range of refractive services, right up to dispensing of spectacles, can be provided on the spot. Frames. There should be a variety of frames available to reflect personal and local preferences. As most people are willing to spend more on an attractive pair of spectacles, this can provide the required income to sustain the services of the vision centre. Smaller frames need to be available for children. Lenses. Only commonly required dioptre powers should be stocked – other lenses must be ordered. With proper inventory planning, on-the-spot dispensing of about 85 per cent of orders can be achieved. However, this will require an inventory that is roughly ten times the expected number of orders. The proportion of on-the-spot dispensing therefore depends on the inventory size that can be achieved. Other accessories. Spectacle cases, cleaning materials. Outreach refractive services can only be a short-term strategy to meet needs. However, an outreach strategy can play a big role in supporting permanent vision centres or health centres, as well as enhancing the reputation of the provider and reducing costs for patients by meeting their needs there and then. 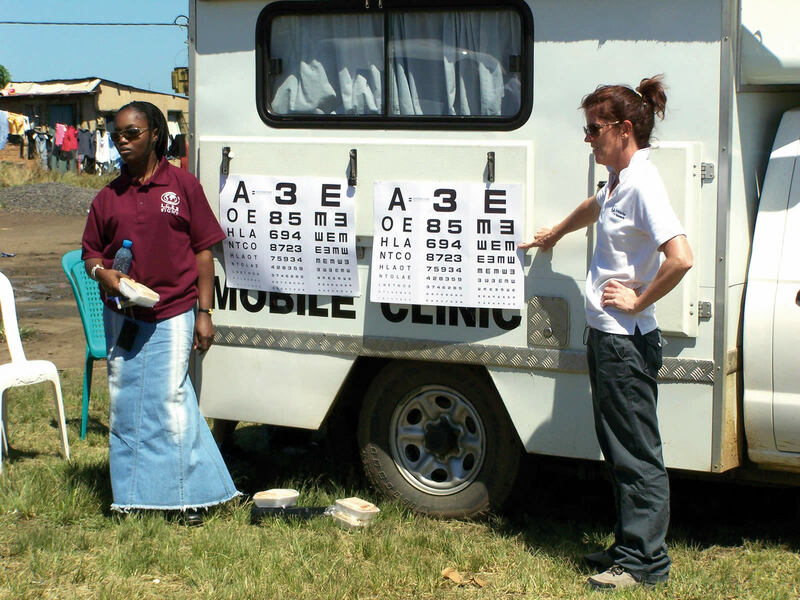 The International Centre for Eye Care Education (ICEE) has been conducting outreach clinics in KwaZulu-Natal, a province of South Africa. ICEE sent teams to outlying and rural areas by road and by air, the latter in partnership with Red Cross Air Mercy Services and the South African Department of Health. improperly matched recycled spectacles often result in visual complications and poor cosmetic appearance (these should only be used as a last resort). Relationship building. In order to ensure that there is cooperation and support (buy-in) from the department of health, ICEE clinics are held in rural primary eye care centres or rural hospitals. The service is advertised with the help of local health centres. Equipment. Includes a trial case, trial frame, occluder, ophthalmoscope, retinoscope, E chart, pupillary distance (PD) rule and tape measure. An autorefractor is carried by the Red Cross Air Mercy Services. Sustainability. In order to make these services as affordable as possible, ICEE does not make any profit. However, to ensure that services are sustainable, ICEE calculates what it costs them to provide the service and then charges patients accordingly. Patient numbers are kept high by the advocacy efforts of local clinics and department of health in the community; this makes services economically viable. Exit strategy. The ICEE exit strategy entails handing over refractive services to local health care providers. ICEE trains local personnel (ophthalmic nurses) in refraction services and advocates for optometrists to be employed. No optometrists were employed in the public sector when the ICEE program started; currently there are 13 in employment. Out of 11 health districts visited initially, ICEE is now serving only four. This reflects the belief that outreach clinics are a short-term strategy: they help to show that there is a need for services, which then prompts government and other providers to develop permanent services. Spectacles. Ready-made spectacles (which have the same prescription in each lens) are dispensed immediately. 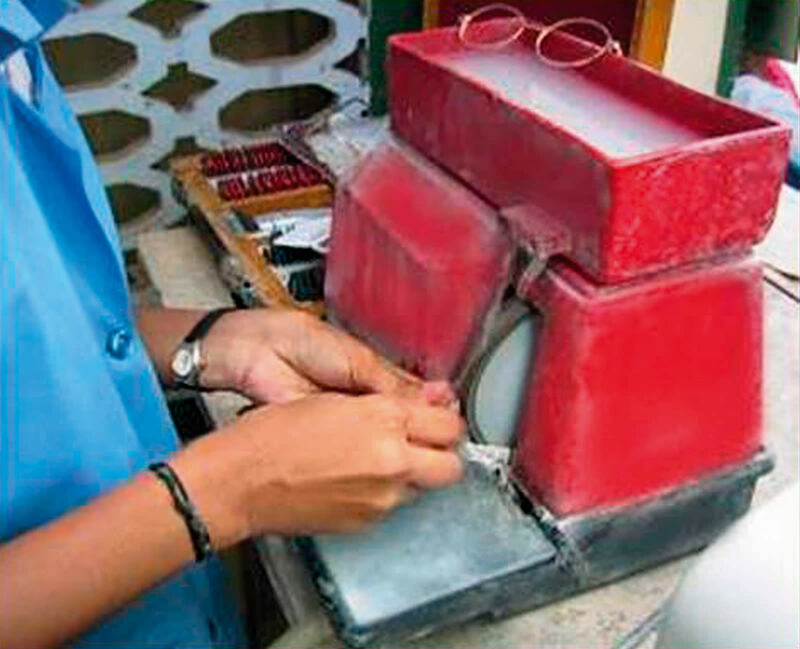 Custom-made spectacles are produced and sent to the clinic where the patient was seen. With basic equipment and a small inventory of lenses and frames, some spectacles for simple refractive errors can even be fitted and delivered there and then. Case finding. Screening in schools and in communities is critical to boost patient numbers and to ensure that clinicians time is used optimally. With funding from USAID, ICEE has trained 50 vision screeners who visit schools on a daily basis. The provincial department of health has agreed to employ these screeners once the funding runs out; this will strengthen human resources capacity in the long term. Volunteers. If necessary, volunteers should be incorporated into existing outreach programmes and function within that ethos. Changing the strategy when volunteers are available and then reversing this later is not in the best interests of the programme. Outreach for advocacy. ICEE programmes target areas where there are no services and the potential for a future eye clinic is high. To do this, ICEE links up with the government outreach clinics and adds refractive services to the package of existing services. This demonstrates the value of refractive services. Caring. Ensure that outreach does not imply lower standards of care; adopt clear management protocols. Consistency. Develop appropriate guidelines regarding the structure of the programme, its pricing policy, and the type of spectacles offered in different areas, as well as protocols to maintain standards of care. Convince other service providers to adopt a similar approach. Comprehensiveness. Refractive services should be linked to a comprehensive package of eye and health services, either by direct delivery of services or through an appropriate screening and referral network. It is important to fully exploit the potential of refraction services in order to achieve the goals of VISION 2020: to bring sight to the millions of people who are blind or visually impaired due to refractive error. The income generated by providing refractive error services to more people will in turn provide the required economy of scale for these services to become sustainable – a win-win situation. Aravind Eye Hospital in South India has developed an innovative approach to addressing all aspects of eye care in remote and rural areas. It has set up a network of special vision centres to serve rural areas around each of its secondary and tertiary eye hospitals. Each Aravind vision centre covers a population of about 40,000 to 50,000. The centres are equipped for refraction and the dispensing of spectacles. For comprehensive diagnostics, they have a slit lamp fitted with a digital camera,a glucometer, and a computer with webcam and internet connectivity (this enables real-time interaction with ophthalmologists at the base hospital). The centres are run by well-trained ophthalmic assistants, who perform slit lamp examinations and refraction, treat minor ailments, provide counselling, and so on. They are also trained to dispense medicines and spectacles. Patients who require further investigation or advanced interventions are referred to the base hospital. Field workers identify people with eye problems and refer them to the centre. They conduct school screening camps and awareness campaigns, and take care of the many marketing activities required. Field workers also provide community-based rehabilitation for the incurably blind. At the vision centre, patients are charged a nominal fee for the examination and pay for spectacles and medicines. 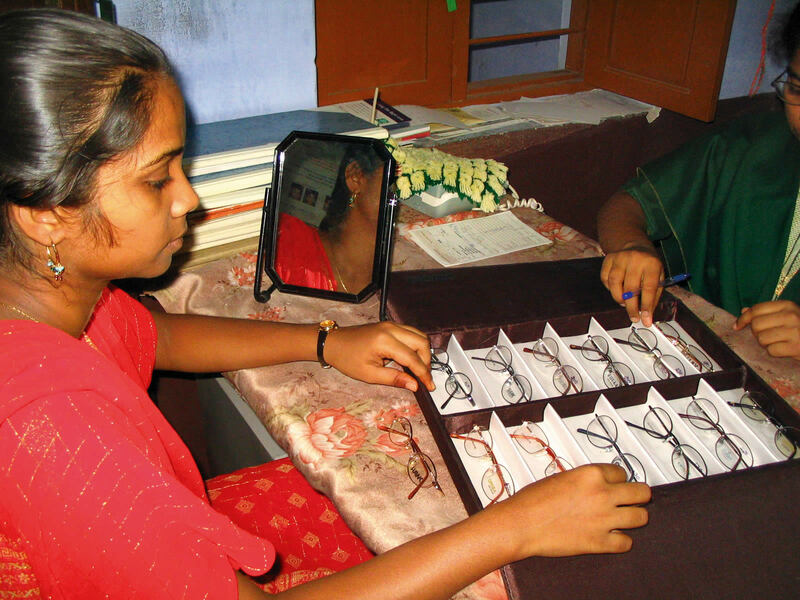 Income from the sale of spectacles is helping the centres to move towards financial sustainability. Refractive error services provide an opportunity to identify patients with other conditions, such as glaucoma, cataract, and diabetic retinopathy, although they are not often used in this way. A service dispensing spectacles is in fact more likely to attract patients than a surgical programme, as fear of surgery may prevent some patients from attending. Developing refractive error as a screening strategy therefore becomes an attractive option. Rather than including the correction of refractive error as just one of the services in an outreach programme, it may be more useful to consider refractive error as the anchor of an outreach programme; it has the potential to attract all patients with visual impairment. Patients needing eye care can then be identified from among those who need refractive error services. This strategy is particularly relevant, given the fact that patients with presbyopia are usually at high risk of age-related eye diseases as well. However, it demands a coordinated and integrated approach to outreach clinics, rather than having separate programmes which result in unnecessary duplication of efforts. In order to function as a screening tool for other eye conditions, refractive error programmes must ensure that they include comprehensive eye examinations. If they don’t, they will squander the opportunity to identify other eye conditions that require intervention.